Trail: Sunset Ridge Trail to Millard Canyon up to Dawn Mine, Dawn Mine Trail to Dawn Station down to Cape of Good Hope, down to Echo Mountain via the Lower Mt. Lowe Railway Trail and return via Sunset Ridge Trail. Track Map for Millard Canyon to Dawn Mine and Echo Mountain from February 2018 using Backcountry Navigator (US Forest Service-2013 map) from my phone. Stats: 9.5 miles, 2,280′ of gain and loss. Section Profile for Millard Canyon to Dawn Mine and Echo Mountain from February 2018 using Backcountry Navigator (US Forest Service-2013 map) from my phone. Route Description: Take the Lower Sunset Ridge Trail to the JCT with the road leading to the Cape of Good Hope. Follow the road up about a quarter mile to the connection with the Upper Sunset Ridge Trail and take that until you reach the junction with the Millard Canyon Trail. Go left and down at the junction and pass the cabin as you make your way up Millard Canyon. About 0.3 miles up the trail is a trail sign with an arrow that simply indicates the way to continue along the Millard Canyon Trail. However, the sign also is at a junction for the Saucer Branch Falls. It is a short 0.1 mile round trip side trip to the base of the Falls. Currently, the view of the falls is mostly blocked from below due to growth in vegetation. However, the trail itself to get to the base of the falls was recently maintained. Getting above the pool at the base of the falls is not safe (or even feasible for most people without climbing gear and special training). So, for everyone else (myself included), enjoy what is viewable and return to the Millard Canyon Trail. Follow the trail up the Canyon until you reach another junction. There will be three ways to proceed. Down on the left leads to the entrance to Dawn Mine from below. Access into the mine itself is now closed off. The trail forward leads nowhere and may have been an older route. 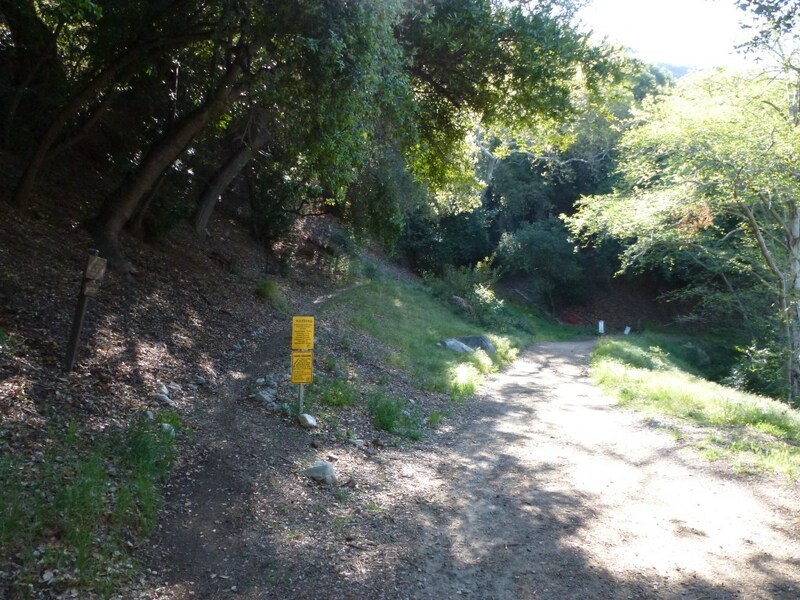 The trail on the right with stone steps is the continuation of the Millard Canyon Trail. About 0.1 miles further there is another junction with a trail sign for Dawn Mine. This is the upper approach to the same entrance to the mine and appears to be the one that will be maintained moving forward. After going to the mine from one of those two routes, return to the Millard Canyon Trail and continue up the canyon for a short distance past the upper junction to Dawn Mine to the junction on the right for the Dawn Mine Trail. Follow the Dawn Mine Trail up to Dawn Station and then follow the Upper Mt. Lowe Railway Trail down to the Cape of Good Hope. Go down the road a short distance to the JCT with the Lower Mt. Lowe Railway Trail and follow that down to the JCT with the Lower Sam Merrill Trail and continue straight to the White City Ruins at Echo Mountain. Return to the Cape of Good Hope and follow the Upper Sunset Ridge and Lower Sunset Ridge Trails back to the Millard Canyon trailhead.